Who am I? Where did I come from? Where am I going? If there are fundamental reason for studying anthropology and cultivating a compelling interest in archaeology the above starting rhetorical questions may be a preliminary beginning. During the passage of eight months of a CAS Program season CAS members span the globe, with the guidance of superb speakers searching for the truth of humankind. During 2016-2017 we traveled to Armenia, visited an Egyptian gallery of ancestors, explored ancient structures of Gobekli Tepe (the world’s oldest temple) in Turkey, and marveled at the genius of Peruvian engineers who converted the challenging altiplano, often harsh and even cruel, of the Andes to a horn of plenty. These remark-able adventures come to us through the ceaseless efforts of Vice President Lucy Kennedy, thank you Lucy! The season is climaxed in May but year after year illusive truth keeps her distance and like Oliver we want more, please! Odd-ly unable to find illusive truth during an eighth month lecture program officers plan a one day Summer Safari—a penultimate effort so-to-speak. Early in 2017 Mike Ruggeri and Ray Young proposed a visit to Beloit College and the Logan Museum. The Logan is no stranger to the CAS, but a warm invitation from Curator Dan Bartlett was a superb decision. The Safari visit included a sur-vey of the surviving Indian Mounds. The Beloit College campus features 20 conical, lin-ear, and animal effigy mounds built between about AD 400 and 1200. One, in the form of a turtle, has inspired the symbol (and unofficial mascot) of the College. 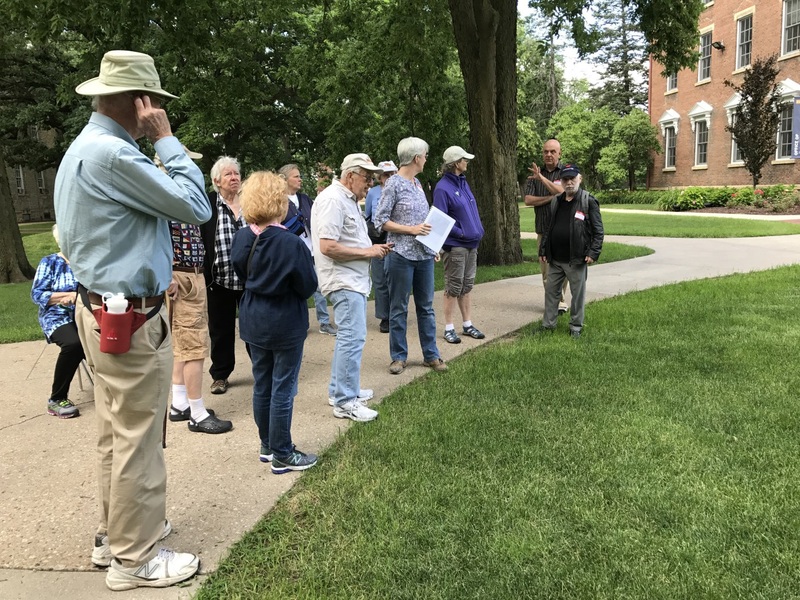 Sara Pfannkuche escorted the CAS group on a cam-pus tour of the mounds providing encyclopedic details of their history. The Logan Museum houses approximately 15,000 ethnographic and over 200,000 archaeological objects from 129 countries and more than 600 cultural groups. Collections de-rive from research expeditions, field schools, gifts, exchanges, and purchases. The museum’s diversity and the fact that it is a teaching institution has attract-ed global attention e.g. a group of French archaeologists traveled to Beloit to study the Paleolithic collection. Most importantly the museum is a teaching museum! Dan Bartlett prepared a special exhibition for CAS Traveling Explor-ers—WE SAW AND HANDLED IMPLEMENTS USED BY OUR PREDECESSORS FROM THE ACHEULEAN THROUGH THE MOUSTERIAN and TO THE AURIGNACION! Still searching for answers to the headline questions I was momentarily transformed as I reached out, spanning a time gap of 500,000 years, give or take a millennium or so, and actually touched the past. The 2017 Safari ended with a fun luncheon at the downtown Bushel and Peck’s Restaurant and the awarding of the CAS Certificate of Appreciation to Dan Bartlett.